Clifford Lee Corbin, Major General, United States Army, was born in 1883, who graduated from West Point in 1905. He was Assistant Quartermaster General of the Army from 1940 to 1944. He retired due to disability in 1946 and died in 1966. 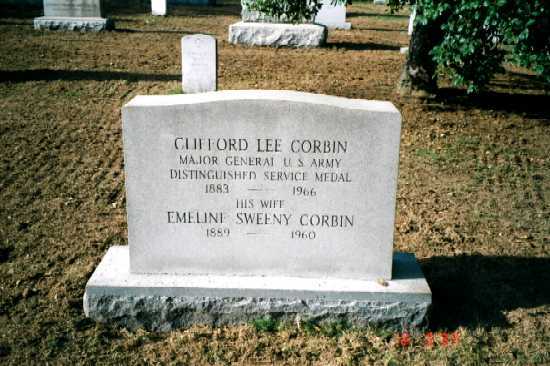 His wife Emeline Sweeny Corbin (1889-1960) is buried with him. 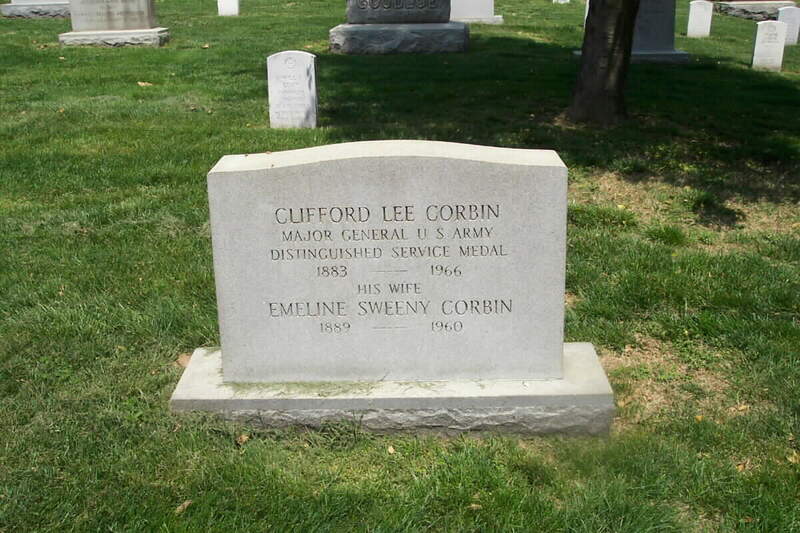 He is buried in Section 2 of Arlington National Cemetery, adjacent to Henry Clark Corbin, Lieutenant General, United States Army. WASHINGTON, January 21, 1966 – Major General Clifford Lee Corbin, USA, retired, died of pneumonia yesterday at Walter Reed General Hospital. He was 82 years old. General Corbin, a 1905 graduate of the United States Military Academy at West Point, retired in 1946 after more than 40 years of active service. He had received the Distinguished Service Medal, after serving in the Quartermaster and Procurement Divisions of the Army. In 1933 he was chief of the American War Memorial and Chief of the American Graves Registration Service in Paris. A year later he was named Chief of the Procurement Branch in the office of the Quartermaster General. General Corbin was a native of Vandalia, Ohio.